The Strömstad Spa & Resort is located in Strömstad, near the idyllic island of Nötholmen. Just a few metres from the sea, this is the perfect place to relax and feel great. It's easy to unwind in these stunning surroundings! This is a cash-free hotel. Strömstad Spa & Resort has everything you want in an idyllic Swedish archipelago destination – and plenty more. Located just outside the town of Strömstad, this design hotel is surrounded by fields of flowering heather and sun-drenched rocky coastlines. With its bold, dramatic architecture, Strömstad Spa & Resort is the perfect destination if you're looking for something really special. Whether you're after a relaxing spa visit, a family weekend together or the perfect conference facility, we've got it all. 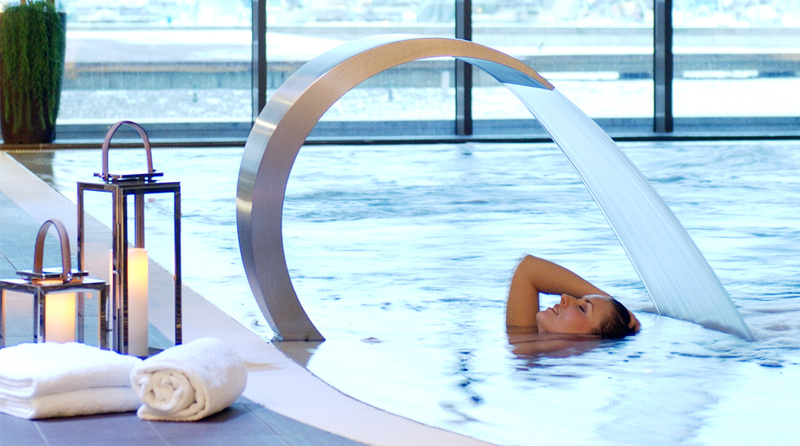 The Strömstad Spa & Resort is cash-free, which ensures added security for our guests and visitors. More information about this can be found under FAQs. Our Decléor Aroma Spa was created with two objectives in mind. First of all, we wanted to create a spa unlike any other and, secondly, we wanted to offer relaxing experiences with something for everyone. And we believe we've achieved both of these objectives with our spa – all 2,000 m2 and two floors of it. Your biggest challenge will be deciding what to do first. Do you have high expectations when it comes conference facilities? So do we. Any successful conference starts with the two basics: comfortable rooms and good food. Here at Strömstad Spa & Resort a visit to the spa is a natural part of any conference. As well as the beautiful surroundings and the many other activities we have to entertain you or help you unwind. We can help you plan and coordinate anything from a small board meeting to a major international conference. We customise package solutions according to your specific preferences and requirements. Find out more about our conference facilities . Our Maritimus restaurant has a fantastic location, just 10 metres from the water's edge. Some areas of the restaurant have just been renovated (in 2014) with a stylish, elegant interior. Enjoy quality wines, a varied à la carte menu and an extensive, delicious evening buffet. Our outdoor terrace is open throughout the summer, with unbeatable views of Strömstad and the marina outside the hotel. Our hotel is right at the heart of the picturesque Swedish west coast. Bring your mates, the girls or your mother along for a wonderful weekend of spa treatments, golfing and unforgettable culinary experiences. Our location, on the outskirts of the charming town of Strömstad, means you can easily combine a bit of shopping with boat trips, outdoor activities and woodland or countryside adventures. Book a truly relaxing break at Strömstad Spa & Resort! Read more about Strömstad here. Take the train to Strömstad Station. From here it's 10 minutes by taxi or bus to the hotel. Take the local bus towards Nötholmen from Strömstad Station as far as the Strömstad Spa bus stop. (Does not apply during the winter). Take the Sandefjord-Strömstad ferry with Color Line. Take the airport shuttle bus to the Nils Ericsson terminal. Take a bus or train to Strömstad Station. Take an airport taxi directly to the hotel or to the Trollhättan Resecentrum. Take a bus or train to Strömstad Station. Take the airport shuttle train to Oslo Central Station. Then take the bus or train to Strömstad Station. We recommend Taxi Väst, telephone +46 526 459 000. Göteborg Landvetter Airport: 190 km. Oslo Airport, Gardermoen: 180 km. Strömstad Spa bus stop: 50 metres.